Leading the list of emerging technologies for glass treatments are three types of glazings: electrochromic glazing, photochromic glazing, and thermochromic glazing. In each case, the glass is darkened based on different stimuli. For our purposes, none would be appropriate for a windshield treatment since their darkening effects would exceed the maximum amounts allowed as set forth by ANSI/SAE standards. Electrochromic (EC) glazes can be applied to windows resulting in a darkening tint when an electric field is run through the glazing. These glazes need less than 5 volts of electricity to activate and can remain darkened for an extended time without a constant electric field. The window can be returned to its original state with a field reversal. This technology is also called switchable glass or smart windows, and is already being used in some automobile rear-view mirrors to regulate glare response. Sunroofs on high end cars like Maybach and Ferrari are currently using switchable glass. Although transition lenses were first developed by Corning in the late 1960's, they did not gain international fame until the 1990's. Known as photochromatic or photochromic lenses, this innovation in optical technology has been used to combat a foe common to much of society, ultraviolet rays (UV). Transition lenses get their name through their unique ability to darken when in contact with these UV rays. The darkening effect of these “slick shades” is created by embedding millions of microcrystalline silver halides or silver chloride in the structure of glass lenses. 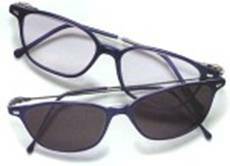 Plastic lenses rely on the uses of organic photochromic molecules (for example: oxazine and naphthopyran). When exposed to direct sunlight the molecules in these lenses undergo a chemical reaction that causes them to change shape. While in this new shape they begin to absorb portions of the sunlight and darken the lenses. The rate and concentration at which these molecules darken is entirely dependent on the intensity of the sun light. In some cases, transition lenses have even darkened in extremely cold environments. Once the UV rays are negated the molecules of the lenses will transform back to there original state thus making the lenses transparent again. An immense flaw with photochromic glazes is that they are useless behind windshields since windshields already negate much of the UV rays needed to alter the chemicals. Lenses with this treatment will not darken in visible light due to difference in frequencies and energies between visible light and UV rays. Consequently, they are unable to prevent glare caused by oncoming head lights. This glazing method uses a gel-based coating and results in the window automatically changing from clear to opaque when exposed to light or warmer temperatures. This glazing is designed to block solar gain. Since the window loses its transparency, this glazing is best suited for skylights or other nonessential window treatments.